Caesar's Bridge across the Rhine, the first two bridges to cross the Rhine River on record, were built by Julius Caesar and his legionaries during the Gallic War in 55 BC and 53 BC. Strategically successful, they are also considered masterpieces of military engineering. During Caesar's conquest of Gaul it became necessary to secure the eastern border of the new provinces against marauding Germanic tribes. The tribes felt safe on the eastern side of the Rhine river, trusting the river as a natural border which offered cover from retaliatory attack after their opportunistic raids into the province. Caesar decided to confront them. He also wanted to show support for the Ubians, an allied German tribe across the Rhine. While he could have crossed the river by boats which the Ubians had offered to provide, he decided to build a bridge, thus demonstrating Rome's ability to bring the fight at any time to the Germanic tribes and additionally, as he indicated in his Commentary on the Gallic War, this approach conformed more to his own dignity and style, than to anything else. Caesar's first bridge was most likely built between Andernach and Neuwied, downstream of Koblenz. Book 4 (Liber IV) of his commentaries gives technical details of this wooden beam bridge. Double timber pilings were rammed into the river bottom by winching up a large stone and releasing it, thereby driving the posts into the riverbed. The most upstream and downstream pilings were slanted and secured by a beam, and multiple segments of these then linked up to form the basis of the bridge. Conflicting models have been presented based on his description. Separate upstream pilings were used as protective barriers against flotsam and possible attacks while guard towers protected the entries. The length of the bridge has been estimated to be 140 to 400 m (roughly 460 to 1,300 ft), and its width 7 to 9 m (23 to 30 ft). The river is up to 9.1 m (30 ft) deep. The construction of this bridge showed that Julius Caesar, and Rome, could go anywhere, if only for a few days. Since he had over 40,000 soldiers at his disposal, they built the first bridge in only 10 days using local lumber. He crossed with his troops over to the eastern site and burned some villages but found that the tribes of the Sugambri and Suebi had moved eastward. The tribes had come together and were prepared to meet Caesar's army in battle, but when Caesar heard of this he quickly left the region taking down the bridge behind him. He was only in the area for 18 days and without any major battle he returned to Gaul and cut the bridge down. 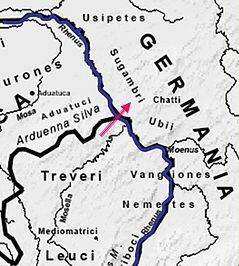 Two years later, close to the site of the first bridge, possibly at today's Urmitz (near Neuwied), Caesar erected a second bridge, built "in a few days", as described in Book 6 (Liber VI). His expeditionary forces raided the countryside, but did not encounter significant opposition as the Suebi retreated. Upon returning to Gaul, the bridge was again taken down. Caesar's strategy was effective, as he was able to secure the eastern border of Gaul. He demonstrated that Roman power could easily and at will cross the Rhine and henceforth for several centuries significant Germanic incursions across the Rhine were halted. Further, his feat served him in establishing his fame at home. With Roman colonization of the Rhine valley more permanent bridges were built later at Castra Vetera (Xanten), Colonia Claudia Ara Agrippinensium (Cologne), Confluentes (Koblenz), and Moguntiacum (Mainz). Speculation about the location of the bridges is due to the temporary nature of the construction and the lack of a precise location in Caesar's report. 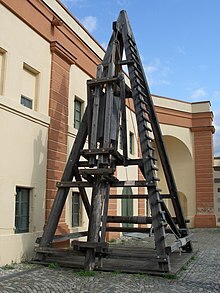 However, diggings in the Andernach-Neuwied area found residual pilings that are considered to be remnants of Caesar's bridges. As an alternative site a place south of Bonn has been mentioned. ^ a b c B.Nebel. "Julius Cäsars Brücke über den Rhein" (in German). Retrieved 2006-09-13. ^ A.Voggenreiter. "Historischer Rückblick" (in German). Archived from the original on 2006-10-16. Retrieved 2006-09-13. Wikimedia Commons has media related to Caesar's Rhine bridges. O'Connor, Colin (1994). Roman Bridges. Cambridge Univ. Press. ISBN 0-521-39326-4. This page was last edited on 5 January 2019, at 12:44 (UTC).